A fire at Niran Grand Condo caused about a half-million-baht damage, but luckily no injuries. 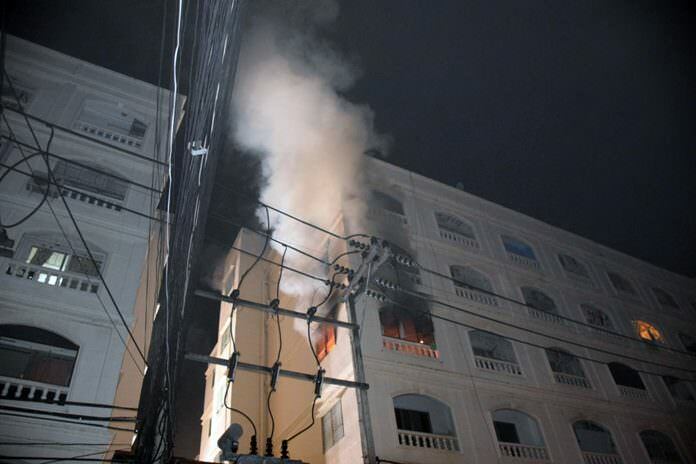 A fire at a central Pattaya condominium caused about a half-million-baht damage, but no injuries. Eight fire trucks responded to the July 15 blaze at the Niran Grand Condo where smoke was pouring out of a fourth-floor unit. It took firefighters about 30 minutes to conquer the flames, but massive water damage took longer to drain. Chatda Areechai, owner of the burned apartment, said she had been out since 9 p.m. for work and came back to see her room completely destroyed. She estimated the loss at 500,000 baht. Previous articleSinging on the wane?